Lonnie Wheatley, WICHITA, Kan. (June 28, 2015) – The one-eight motorsports Sprint Car was left idle in an Oklahoma shop. 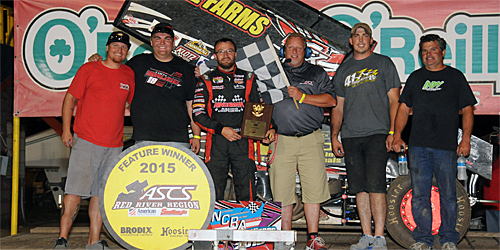 But Tony Bruce, Jr., still made quite the weekend of it, finishing off a sweep of the NCRA vs. ASCS Red River Region Sprint Car double by winning Sunday night’s 25-lap feature at 81 Speedway. “TBJ” had to work for it once again, having an original pass for the lead negated at the halfway point before making it stick in the final handful of laps to go to park the Ochs Brothers No. 1x machine in victory lane for the second night in a row after topping Saturday night’s Steve King Memorial at Dodge City Raceway Park. “They made the right call when they put me back after the first pass, I wasn’t really sure if I could get him again,” Bruce, Jr., said of the lap 13 caution that negated his original pass of J.D. Johnson for the point. Bruce, Jr., who had taken second from Jake Martens on the ninth round, immediately went to work on Johnson for the lead when action resumed. But Johnson was up to everything that Bruce, Jr., threw at him, high and low, until traffic again became a factor. “I needed lapped traffic to play out right to get it,” Bruce, Jr., explained. The Liberal, KS, native found the slightest of openings he needed getting into turns one and two on the 20th lap and squeezed into the lead. Bruce, Jr., raced on from there for his third win over the last nine nights, the most recent pair in the Ochs No. 1x. After starting 11th aboard Gary Swenson’s storied No. 24b Sprint Car in a last-minute deal, Jack Dover was up to fourth with a handful of laps to go and then third when a final caution flew to set up a three-lap charge to the stripe. Dover worked the high-side to get by J.D. Johnson for second but had no time to harass Bruce, Jr., settling for his second runner-up finish in three nights after a run of five straight wins. J.D. Johnson settled for the show position with Jake Martens and NCRA points leader C.J. Johnson (no relation to J.D.) rounding out the top five. Heat Winners (starting position in parentheses): Tony Bruce, Jr. (2), C.J. Johnson (1), Jason Martin (1). Heat Moments: After picking up Hard Charger honors one night earlier at Dodge City, Shawn Petersen was displeased both pre and post-race when sent to the tail from his pole starting position in the first heat after requiring a second push; Luke Cranston and Joe Wood, Jr., surrendered second and first row starting positions, respectively, in subsequent heats after missing out on necessary wheel-packing of the track after a shower that hit prior to race time; after starting sixth in the first heat, Harli White nearly nipped Alex Sewell at the line for second only to be disqualified for bypassing the scales; J.D. 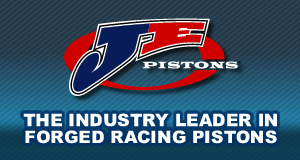 Johnson and Jake Martens both went sixth to second (Martens aided by Wood, Jr., to the tail) to earn front row feature starting berths; Joe Wood, Jr., brought out the only heat race caution when a tie rod bolt broke, which made steering a challenge. “B” Main Winner (starting position in parentheses): Jeff Stasa (2). “B” Main Moments: Stasa wired it while Wood, Jr., went seventh to third and White from 11th to sixth. 12 laps – Shawn Petersen spins to a stop off the top of turn one, he rejoins the field. 22 laps – Luke Cranston turns it around exiting turn four, he rejoins as well. “A” Main Hard Charger: Dover’s gain of nine from 11th to second was nice, but Harli White swiped 11 positions with a charge from 20th to ninth. Heat One (10 Laps): 1. 1x-Tony Bruce, Jr., 2. 8x-Alex Sewell, 3. 85-Forrest Sutherland, 4. 81-Jon Freeman, 5. 4x-Shawn Petersen, 6. 26m-Fred Mattox, 7. 5-Ty Williams, 8. 20g-Jake Greider, 9. 17w-Harli White (DQ – Failed to report to scales after finishing third). Heat Two (10 Laps): 1. 45x-C.J. Johnson, 2. 8-J.D. Johnson, 3. 9x-Jake Bubak, 4. 21-Josh Fairbank, 5. 24b-Jack Dover, 6. 91-Jeff Stasa, 7. 20-Luke Cranston, 8. 72-Raymond Seemann, 9. 6-Kaden Taylor. Heat Three (10 Laps): 1. 5x-Jason Martin, 2. 48-Jake Martens, 3. 2-Mickey Walker, 4. 10c-Jeremy Campbell, 5. 8m-Kade Morton, 6. 05m-Charles McManus, 7. 11-Joe Wood, Jr., 8. 88m-Keith Meyer. “B” Main (12 Laps – 8 Advance): 1. 91-Jeff Stasa, 2. 5-Ty Williams, 3. 11-Joe Wood, Jr., 4. 4x-Shawn Petersen, 5. 20-Luke Cranston, 6. 17w-Harli White, 7. 26m-Fred Mattox, 8. 72-Raymond Seemann, 9. 20g-Jake Greider, 10. 6-Kaden Taylor, 11. 05m-Charles McManus, 12. 88m-Keith Meyer. “A” Main Finish (25 Laps): 1. 1x-Tony Bruce, Jr. (3), 2. 24b-Jack Dover (11), 3. 8-J.D. Johnson (1), 4. 48-Jake Martens (2), 5. 45x-C.J. Johnson (4), 6. 5x-Jason Martin (5), 7. 81-Jon Freeman (7), 8. 10c-Jeremy Campbell (12), 9. 17w-Harli White (20), 10. 8x-Alex Sewell (6), 11. 9x-Jake Bubak (9), 12. 8m-Kade Morton (13), 13. 91-Jeff Stasa (15), 14. 11-Joe Wood, Jr. (17), 15. 72-Raymond Seemann (22), 16. 4x-Shawn Peterson (18), 17. 2-Mickey Walker (10), 18. 5-Ty Williams (16), 19. 20-Luke Cranston (19), 20. 21-Josh Fairbank (14), 21. 85-Forrest Sutherland (8), 22. 26m-Fred Mattox (21). Lap leaders: J.D. Johnson 1-19, Tony Bruce, Jr. 20-25.